Gov. Larry Hogan’s FY 2020 budget, released Friday, should allow Maryland’s public universities to keep tuition low for in-state students. With the funding proposed, the universities should only raise tuition 2 percent next year for in-state students, University System of Maryland Chancellor Robert Caret said Friday. Caret also praised Hogan for including funding for economic development initiatives, including $20 million for a Workforce Development Initiative aimed at producing 3,000 more graduates a year in STEM, cybersecurity and health care fields. “Growing the pool of talented Maryland workers in these fields will ensure we can meet the workforce needs of these burgeoning industries, attract more of these businesses to the state, and continue to grow jobs throughout the region,” Caret said. Last year’s budget also raised tuition for in-state students 2 percent. 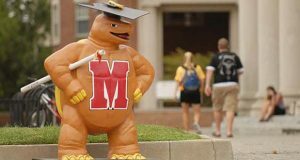 Tuition at the system’s flagship campus, the University of Maryland, College Park, is $10,595 for in-state students and $35,216 for out-of-state students this year. With estimated costs for room, board and fees, those rates rise to $26,796 for in-state students and $51,417 for out-of-state students. Those numbers also include estimates of costs for travel expenses and books.